"Akka, charge maadla?" She asks, pointing to the switch board and holding her phone and charger in her hands. I nod as she walks up the charging unit and plugs in her changer and attaches it to the phone. She waits for a few seconds to check if the phone is charging. From where I sit, all I can see is fluorescent light on her pale face. I haven't seen those type of phones since ages. Infact I'm not even sure they make them anymore. She leaves the phone on the floor and I ask her to leave it on the side table instead. She sheepishly smiles and does as told. I continue reading the newspaper and have my daily cup of morning tea while she walks to the backyard to wash the dirty laundry that welcomes her every morning. She is way too younger than me, but is already a mother of three. Her phone kept ringing as it charged and I heard the water tap go on and off many times. She answered the call and went back to work. This happened quite a number of times and I go to ask her what's going on. The conversation happened in Kannada, but I'm translating it here. Me: Way too many calls today. Any problem. She: Yes akka, I go to other houses also right so they all are calling to check when I'll come. Me: How many places do you go to? She: In a day around six. Me: That's a lot, is it only washing? She: Washing clothes, vessels, cleaning the house, toilets, front yards, backyards and sometimes I cook also. Me: Isn't it too much to do? She: It is, but what else can I do? My husband doesn't earn much and I have three daughters to be looked after. She (proudly): At this age, what will they do akka. They go to school and study. Me: All three of them? Me: Are you able to manage all the expenses? She: Mostly yes. But it gets difficult at times. The fees I manage to pay, but books and uniforms we get from a trust. She: Yes akka. They are very good people. They help us when we need something. Only for the girls though. They give them books, old clothes, water bottles and sometimes toys as well. Me: Wow, isn't that good? She: People like us need only the basics akka, we are happy with that only. I don't want my daughters to become like me. I want them to be educated and fend for themselves in a dignified manner. The trust helps us as much as they can. The trust is run with the help of donations. Half of it goes to the blind school behind Ganesha temple. The rest is distributed to the government school where my children study. Me: That's really good. So, how can I help? She: You already help akka. That's enough. She: You gave me all those old clothes last week na? I kept some for the girls and then gave the rest to the trust to give it to others. My daughters have enough already. I get a lot of other things from the other houses I go as well. I only keep how much we need and give away the rest. Others also need help, akka. Her phone rings again and I walk back to my seat, deep in thought. The next day I visit the trust. Turns out it is an NGO run by a retired army officer and his wife. They accepted donations in terms of cash or kind. I paid them a certain amount and promised to send out some clothes and groceries every month. The next month I sent them a box of books that I had read enough times. Apparently, kids in the school fought for them and some even read them jointly. I felt proud of myself. More than myself, I felt so proud of the army officer and the wonderful work that they were doing. As long as there are people like him in the society, the underprivileged get their basics. There are many such NGOs run in the country to support senior citizens, children and education. Education is a basic right and some NGOs donate food and other rations to families in return for having their children sent to school. One such NGO is Aham Bhumika. Located in Bhopal, Aham Bhumika is set up by a group of people who are a little better privileged than the others. A huge group of them have come together to help the underprivileged in the rural areas of the country. The reason I'm taking about this one NGO in particular is because today they are in trouble and all it would take is a little effort from you and me to help them. Aham Bhumika runs a pre-school that faces a threat of being shut down due to lack of funds. They are receiving some good donations from a lot of generous people but still that seems to be insufficient. The amount that the school needs to maintain their expenses is less that Rs. 15000 a month, and yet they struggle to get there. Some of us atleast make twice or thrice this amount per month. No, I'm not asking you to give it all away. You can even contribute Rs 1000 every month and make a difference. There might be several others like you, who will do the same. 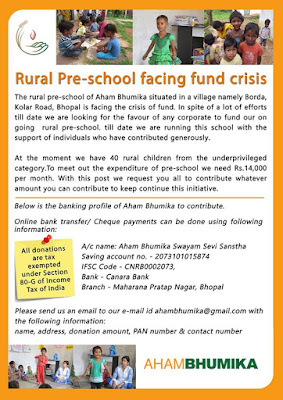 Together we all can help Aham Bhumika stay afloat without any trouble. 1. Donate in cash. As much or as little as you are capable of. Bank details given below. 2. Donate in kind. 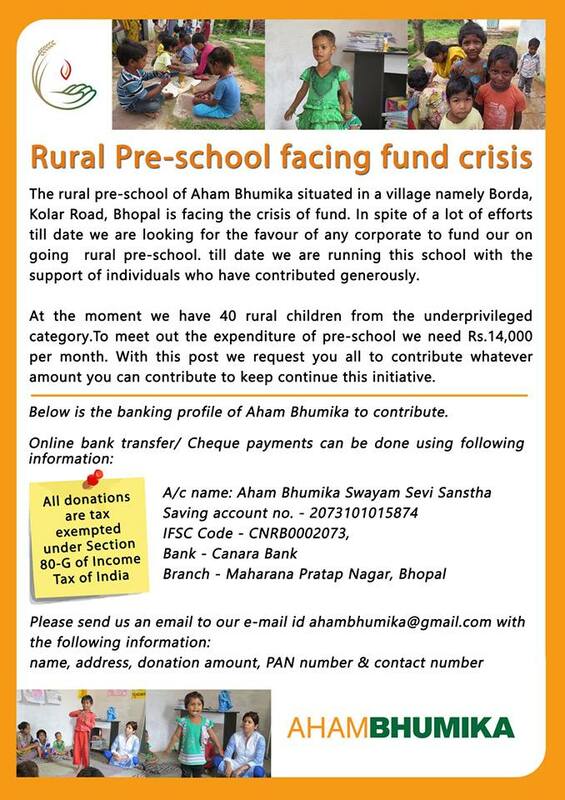 Aham Bhumika have their collection centres in few areas of Bhopal. You can give away books, clothes, lunch boxes, toys or anything else that you know will please a child. 3. If you are in Bhopal and have some spare time, please go visit the school and share your knowledge and other skills that you think will benefit them. I once took a laptop to an orphanage here in Bangalore to have them type their name on it. You have no idea how happy those kids were just to touch the laptop. If this is too much to ask, teach them to draw or paint, dance or sing instead. 4. If the above is not your cup of tea and yet you want to help them, you still can do it. How? By buying some of their handmade merchandise. They have embroidered bags and cushions and hand painted shoes that look so bright and colorful. Just like those children who are happy to have decent education today. If something is not done, this basic right might be taken away from them. Lets us join hands and do our bit to help them. In any possible way. Talk about this or write about this. Let us create a buzz on social media using #FundAhamBhumika. These kids might turn out to be like you and me tomorrow, let us give them that extra push to get there. 1. ahambhumika@gmail.com: Write to them for any queries. 2. Facebook, Twitter: You can learn more about what they do here. 3. Blog: Just go check this out to see the wonderful work they do. Donate the sum you want to and drop them an email on the id mentioned above with the following information. Name, address, donation amount, PAN number and Contact number. All donations will be tax exempted under section 80G of income tax of India. 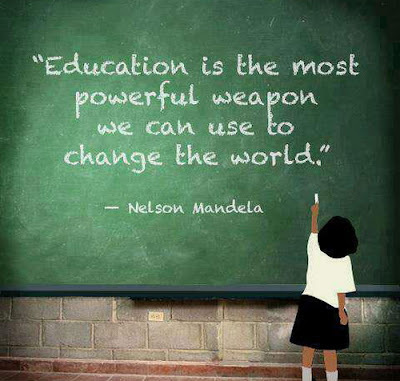 Come join me in helping these kids continue their education. Yeah - a little bit of help can really go a long way in helping others. I loved the way your house-help was ready to give away even from whatever little she had. It is surprising how people ca be generous even when they have so little themselves.